The A447 between Barlestone and Market Bosworth will be closed from Monday September 12th 2011 for 6 weeks until Monday October 24th. The closure is due to bridge repair works which are taking place beside the junction between the A447 and Goatham Lane, which leads into Osbaston Village. The work involves exposing the existing brick arch and installing a concrete saddle. Whilst the road is closed, main road traffic is being diverted at the ‘Bull in the Oak’ junction near Market Bosworth towards Newbold Verdon, then around Barlestone village through Newbold Heath. Such diversions have seen up to half-mile traffic jams leading from the Newbold Road junction due to the increase in traffic in the area at busy periods, as cars travelling to Leicester have to give way to diverted traffic heading towards Hinckley. Barlestone Post Office is to ‘Temporarily’ close on September 24th 2011 after the retirement of Sub-Post Mistress Heather Ball. The village post office will close indefinitely until a suitable replacement location for the post office is found, according to Post Office Ltd.
After Sept 24th, villagers will have to use the nearby Post Office in Newbold Verdon as there will be no other Post Office facilities in the village. Villagers will also be left without the ability to make free cash withdrawals without leaving the village. Residents of Barlestone may find it difficult to make the journey over to Newbold due to recent cutbacks on the local Arrive Bus Service, reporting by Barlestone net earlier this year. Will The Post Office Be Replaced? 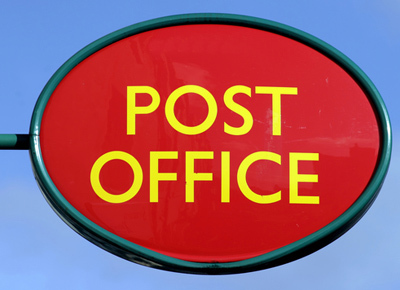 Post Office Ltd say they will be looking for a replacement for the Post Office in the village, but with only two village shops remaining (the village Co-Operative and Barton Road Stores) options are limited. In a time when the Royal Mail is saving costs wherever it can, will they see this as an opportunity to close the village Post Office permanently? Heather is retiring from the Post Office after many years working in the village Post Office, which is also her home. Heather was voted Barlestone Citizen of the Year in 2009, and switched on the village Christmas Lights in 2010. We wish her a very happy retirement and say thank you for the many years of service you have provided to the village. You can comment on this story by using the Comments feature below. Wednesday July 17th saw Barlestone once again fall victim to scrap metal thieves as they attempted to pull out metres of copper telephone wiring from the A447 outside of the village. 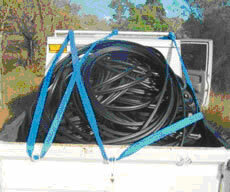 Metal theives break into BT manholes and cut the telephone cable at two points along the road, then attempt to rip it out of the ground by tying it to a vehicle in order to cash in on soarng scrap metal values which have seen copper fetch as much as £6,000 a tonn. Local residents and businesses such as the village Co-op were left without telephone and Internet services whilst BT OpenReach were left to repair the damaged lines. Service was restored to the village on Sunday morning. As well as local businesses being unable to process credit card transactions, Barlestone Surgery was also left without telephone lines while the cable was being replaced. Furthermore, villagers were left without telephone lines of their own, meaning many would have been unable to call the emergency services should they have needed. 1) Upgrade the BT phone network to Fibre Optic. 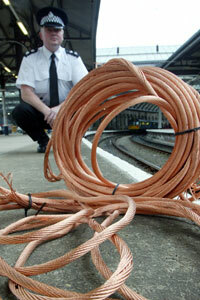 Fibre Optic cables are made of glass, and don’t have any scrap value to theives. BT are upgrading their network (to their 21st Century Network) however as yet there is no forecast date for Barlestone or surrounded villages served by Market Bosworth Telephone Exchange. 2) Enforce Waste Carriers Licences. Waste management laws dictate that any vehicle carrying waste must be able to document where the waste came from, and that they are licenced to carry it. If the police enforce waste management laws, theives would have a harder time carrying the stolen metal and disposing of it. 3) Eliminate the means to scrap stolen metal. Enforcing the law at scrap metal dealers not to accept telephone cable, manhole covers or any other suspect material would help deter the theives from stealing it in the first place. If scrap revenue was paid into bank accounts and not in cash, this would also deter many theives from using this as a means to make money illegally. The theft of the telephone cabling outside of Barlestone was covered by the Leicester Mercury, who like us are appealing for anyone who knows anything about the thefts to claim £1,000 in reward money and to telephone 0800 555 111. That is as if we all didn’t know anyway. The annual Barlestone village Street Parade has been announced for Saturday July 2nd. The stree parade is organised each year by the Barlestone and Osbaston Community Association (BOCA) and the Friends of Barlestone School (FOBS). In a change to previous years, the walking street parade will start from Church Road, and not Meadow Road. The parade will gather in Church Road from 1pm on the Saturday, leaving to walk through the village and towards Barlestone Primary School at 1.20pm. The parade will then end at the Primary School at 2.00pm at which point the summer fete will commence! The theme for this years parade will be ‘Goodies and Baddies’! You can help promote this event by ‘Liking’ this page, which will help advertise this even on Facebook. Our walkers will mainly be children from Barlestone Primary School plus various other village groups, however anyone can take part either as a group or individuals, plus the organising committee would welcome any stewards and collectors (as a collection team will be following the street parade to raise money for local community groups). The ‘theme’ of ‘Goodies and Baddies’ is not mandatory, but if you are taking part then this is your chance to become the hero of villain of your dreams! BOCA aims to provide a vehicle to enhance the social, cultural and educational needs of Barlestone and Osbaston and also raises funds for the benefit of our local community. In the last three years BOCA has contributed funds to St Giles Youth Football Club, First Steps playgroup, Just4Kids and each of the villages ‘uniformed’ groups (Brownies, Cubs etc) as well as the community First Responders as their chosen beneficiaries. The street collection will be used to boost the funds available for our 2011/12 good causes. For further information please contact Cathy Mullins on 01455 292 957 or 07917 022 114. Barlestone has become the latest in a long line of towns, villages and cities to be plagued by a fake Air Ambulance charity collection scam. 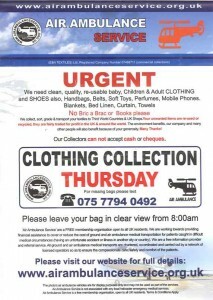 The scam works by tricking householders into thinking that the collection service is from their local Air Ambulance, but in actual fact is from a private company who are looking to collect free items of clothing for their own commercial gain, by using the Air Ambulance Name. Upon closer inspection is is clear that the ‘Air Ambulance Service’ is not quite as it seems. No Registered Charity Number is given (this is because the fliers come from a commercial company). “Air Ambulance Service’ are (sp) a free membership organisation open to all UK residents. We are working towards providing assistance to cover or reduce the cost of ground and air ambulance medical transportation for patients caught in difficult medical circumstances (having an unfortunate accident or illness in another city or country). We are a free information provider and referral service. All ground and medical transports are chartered, co-ordinated and carried out by a network of licenced operators so as to ensure the compassionate care, sdafety and comfort of the patients”. “The photo’s air ambulance (sp) vehicles are for display purposes only and may not be used as part of the services. Air Ambulance Service is not associated with any local helicopter emergency services. Air Ambulance Service is a free membership organisation, open to all UK residents. Terms and Conditions apply”. This scam is in no way affilliated with Derbyshire, Leicestershire and Rutland Air Ambulance, who provide their own legitimate collection service on a regular basis to the village. An example of which is shown below. Support of the DLRAA can only be encouraged, however villagers should always check the validity of anything which is delivered door-to-door, and be sceptical of anything whcih does not seem legitimate. Anyone suspecting the legitimacy of a charity collection service should check with the charity in question of it’s validity before sending any items or donations.